ARLINGTON, Va., April 4, 2019 — The newest study of America’s radiation oncology workforce finds that gender and race gaps have narrowed slightly, although persistent and growing geographic disparities point to a need for more equity in access to radiation therapy care. The survey, which drew responses from more than 1,100 physicians across the country, finds that fewer radiation oncologists are practicing in rural communities and that these doctors are more likely to retire in the coming years. 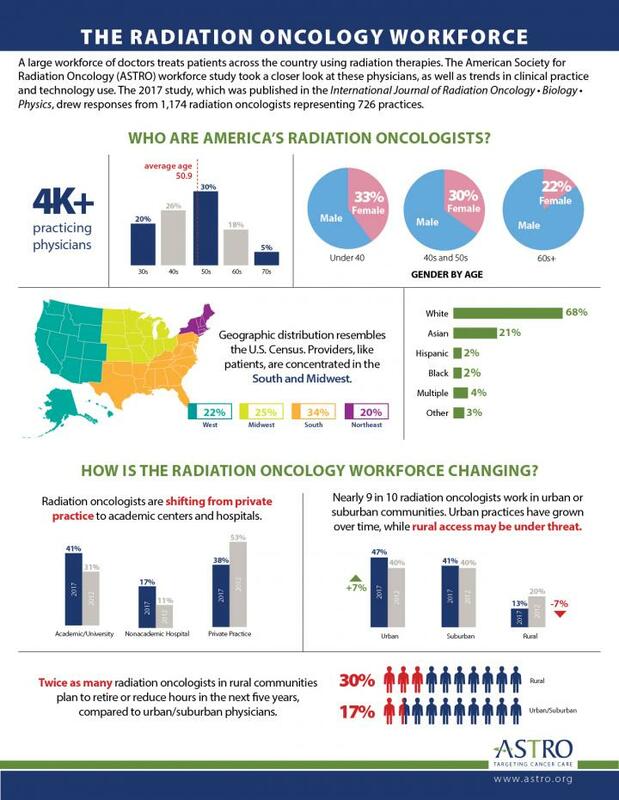 Results of the American Society for Radiation Oncology (ASTRO) 2017 Radiation Oncologist Workforce Study are published in the March issue of the International Journal of Radiation Oncology * Biology * Physics (Red Journal), and an infographic summarizing the results is also available. (1) Shift from rural to suburban and urban locations: Nearly nine in 10 radiation oncologists work in urban or suburban communities (47% and 41%, respectively). Since the previous workforce survey in 2012, the proportion of rural radiation oncologists declined from 16 to 13 percent, indicating that rural access to radiation therapy services may be under threat. (3) Shift from private practice to academic hubs: Radiation oncologists also are shifting from working primarily in private practice to treating patients at academic centers and hospitals. The 2017 survey marks the first time that fewer than half of these doctors work in private practice (38%), with 41 percent practicing at academic/university centers and 17 percent at non-academic hospitals. (4) Widespread adoption of new technology: 95 percent of practices offer shortened, or hypofractionated, radiation therapy, providing their patients a more convenient treatment option without increasing the risk of side effects or the cancer returning. The most common tumors for hypofractionation include breast tumors (94% of practices), bone metastases (92%) and brain metastases (74%). Clinics also increased adoption of advanced technologies and techniques for providing radiation therapy treatments, such as stereotactic radiation and real-time image guidance. ASTRO conducts workforce studies to identify trends in provider demographics, employment and technology use, and to assess the profession’s ability to meet patient needs. The 2017 survey was conducted online, and findings reflect responses from 1,174 radiation oncologists representing 726 practices (31% response rate). (redjournal.org), Practical Radiation Oncology (practicalradonc.org) and Advances in Radiation Oncology (advancesradonc.org); developed and maintains an extensive patient website, RT Answers (rtanswers.org); and created the Radiation Oncology Institute (roinstitute.org), a nonprofit foundation to support research and education efforts around the world that enhance and confirm the critical role of radiation therapy in improving cancer treatment. To learn more about ASTRO, visit http://www.astro.org, sign up to receive our news and follow us on our blog, Facebook and Twitter.